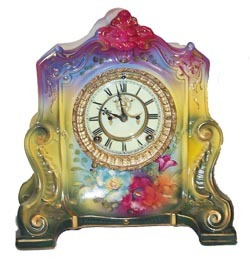 Ansonia Clock Co. porcelain cased clock, "LaCannes" Ca 1904. Another beauty in a Royal Bonn case, properly documented on the back. Outstanding colors starting with the red lions head on top, progressing thru blue, yellow, and green. Nice pink and white flowers front and sides. Case is 12 inches high, 11-1/2 inches wide, near perfect in every way, clean, polished inside and out. Movement and the dial are standard on these fine clocks, including the open escapement feature. They just dont get much better than this. From the Miller collection, of course. Ly-Ansonia No. 2505.